Have you ever been drenched by a desert rain? 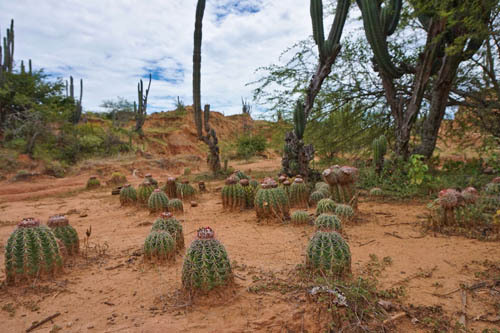 Tatacoa Desert is the place to find one, with its reddish arid expanse stretching from one wall of mountains to another, riddled with sudden drops and numerous cacti. 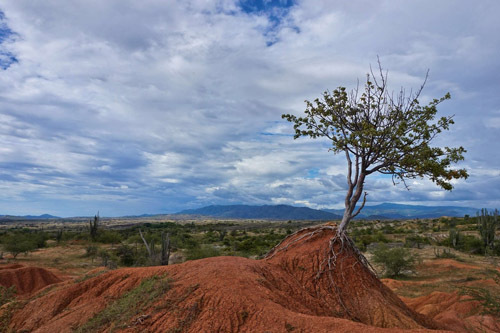 The Tatacoa Desert, or the Valley of Sorrows, as it was called in XVI century by a Spanish conquistador, is a massive swath of arid land in the South of Colombia. Located between two Andes ridges, 330 square kilometers filled with incredible vistas and landscapes, also renowned for its fossils and clear night skies. It doesn’t look like a typical desert one tends to imagine – an endless sea of yellow sand dunes. Depending on the particular location, the dominant color of the place is either ocher or gray, always with a dash of green as it has plenty of plants, too. 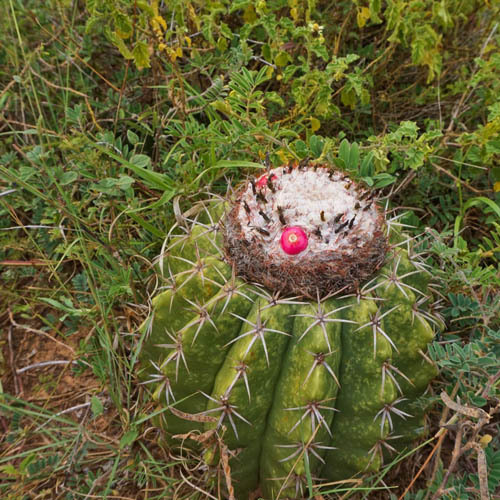 Despite being a desert, the Tatacoa has a lot of flora and fauna that will be of interest to a curious explorer willing to leave the beaten trail and tread the dusty silence alone. An empty remote wasteland where eagles and vultures rule the sky, devoid of the human pollution and far from the big city lights, it’s a great place to observe the vastness of the Universe at night. There are multiple observatories, at least one of them is free for everyone to visit and stargaze after the sundown. Be advised, however, that things may go south if the rainclouds come. During the night that I’ve spent there camping it was constantly raining to my profound frustration, as the observatory never even opened in those weather conditions. We usually imagine deserts as hot and parched fields of sand, but the Tatacoa is not as dry as it might seem, I even encountered a small pool of water while following a dry riverbed. Admittedly, it was shallow and muddy, but it was water. It’s hard to believe an information board at the entrance of the desert which says that the local precipitation is only 1.078 mm per year. Apparently, this is enough to support the many trees, bushes and cacti that cover the eroded cavernous landscape of the desert. Not only plants are thriving – numerous insects and animals are also present. Out there in the wilderness I’ve encountered lizards, spiders, moths, butterflies, vultures, eagles and even goats, while there is also a chance to spot some snakes, scorpions and turtles. Needless to say, this place has no hotels. Besides the observatories, there are only a few private houses, hostels and campings. So in order to spend a night there, it’s better to take a tent and other camping gear, along with water of course, as it gets expensive to buy in the desert. Electricity is hard to come by in this place, as it can only be generated locally, and Internet connection is even more rare. A luxury, I’d say. A part of the serenity of the Tatacoa is being offline, tête-à-tête with nature and yourself. This becomes uncommon these days, it might get boring real quick. It might even be disturbing to some. The transportation here is quite easy – the closest settlement called Villavieja is about 6 km to the west. From there people take mototaxis to bring them into the desert, the way out is to stop one of them on the way back. I came to Villavieja from Neiva in a colectivo, a shared local transport. That’s one way to do it and the drivers of the obviously overpriced mototaxis will try to convince you that it’s the only one. However, there is a more quick, cheap and exciting way to get out, it includes taking a ferry from Villavieja across the uneasy waters of Magdalena river, to city of Aipe. A short countryside hike from the coast and then the streets of Aipe will bring the adventurous souls to a major highway going from Neiva to Bogotá. 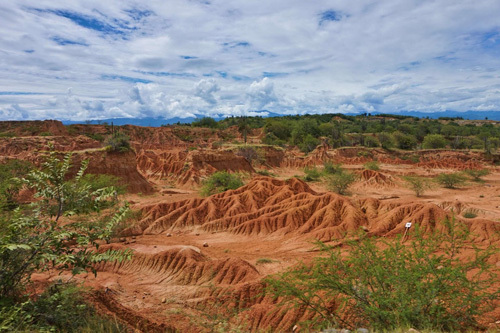 So, if you’re a fan of either astronomy, archeology, nature or just exotic off-the-grid places, the Tatacoa Desert is a place worth visiting at least once in the lifetime. Be sure to bring water, camping gear, sunscreen, raincoat and your favorite camera! Much more by Yuri – along with more, and larger photographs – on his adventurous travels on his very excellent blog and instagram account.